angustifolia = Narrow leaves (Latin). Considered as scarce but on the increase. Locally frequent at Mistra coastline (including upper valley sides), Ghajn Tuffieha (including il-Qarraba), Ta' Cenc in Gozo. Scattered numbers in Mellieha (Qammieh) too. Periploca angustifolia forms a quite large shrub, spreading to a diameter of 2.5 metres and reaching up to 1.5 - 2 metres in height. It is a perennial decidious plant, and leaves appear few weeks after the first outcome of rain (hence at October in Malta), and remain till the end of Spring. It forms repeated branched and sub-branched stems which quickly become lignified and therefore woody. The plant has simple sessile leaves which are oblanceolate or linear in shape, and measure an average of 24mm in length by 6mm in breadth. The leaves have a rough leathery texture, an entire outline and found in opposite pairs or in small clusters along opposite sides of the stems. While the leaves are simple, it cannot be said the same for the flowers - they have a rather unusual morphology. The stalked flowers are found as non-numerous cymes at leaf axils. Flowers have a light green calyx made of 5 very small (4mm long) semi-circular sepals that overlap each other. The actinomorphic corolla consists of 5 rather thick, oblong shaped petals with a notched tip. The petals are light green with a longitudinal red-wine band at the centre that fades to pale green at the tip. There is variation regards the intensity of the wine coloured part of the flower and some plants lack it completely resulting in pale green flowers. Somewhere at the centre of the wine strip of each petal, there seems to be a circular dark patch. Alternating between the petals, are the interesting, curved, filament like corolla segments which have no special purpose and so are purely ornamental. They might look like stamens for the amateur, but they have no reproductive function. The base of these filaments is equipped with 2 V-shaped flaps, and these form like slits or openings located over the petal, with the flap of the adjacent filament base. The stamens and gynoecium are very close to each other at the centre, but are not joined together as in other members of the Asclepiadaceae family. There are 5 smooth, white anthers arranged close together in the form of a ring and each is located few mm away from the openings or slits formed by the flaps of the filamentous corolla segments. The 5 anthers are barely visible, because they are covered by an extended, fluffy, white stigma, coming from a central ovary inside and very close to the ring of anthers. The fruit of this plant is an opposite pair of narrow, grayish-brown, horn-like follicles that can be between 5 to 12cm long. The follicles have a pointed, slightly curved apex and a longitudinal, shallow groove from which they open up. Each follicle holds numerous seeds described as comose, since at one end they have a tuft of many long (36mm), silk-like hairs which aid the attached seed in wind dispersion. The seeds are reddish brown, and measure about 7mm by 3mm. Periploca angustifolia, a native shrub of Mediterranean desert in Tunisia  . According to the Spanish online magazine [WWW-136] , the plant is found in few places of the Mediterranean namely Sicily, Crete, Mauritania and Syria. Distributional range of this plant by [WWW-26] is Cape Verds (Spain) and Canary Islands. Up to 1977, when the book "A flora of the Maltese islands" by Haslam et al  was republished, Wolfbane was reported to be locally frequent in Ghar Lapsi, Wied Babu, Wied Incita, Wied il-Ghasel, Dingli, Mistra, and cliffs below Hagar Qim in Malta. In Gozo it was reported to be found at Ta' Cenc, Xlendi, Mgarr ix-xini, Chambray, Ta' Gordan and west of a site known as Ta' Riefnu. The plant usually has wine-purple striped petals and curly corolla segments. It was shown in some plants the the amount of 'purpleness' varies through all ranges from the normal purple-wine colour to its complete lack resulting in a lime green flower. This is demonstrated in some photos in the photogallery section below. It is not known if this colour deficiency is due to genetical (phenotypic) reasons or due to the lack of certain substances in the soil needed by the plant to synthesize the purple pigment. Mixed flower colours were not observed on the same plant. [SM]. 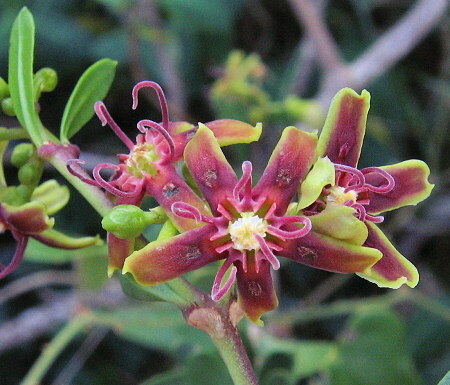 Photo of the few-numbered clusters of flowers and the narrow leaves of the plant. Photo of a typical purple-wine flower. It consists of an actinomorphic, 5-petal corolla and 5 curved corolla segments alternating between the petals. Both reproductive organs are situated at the centre of the flower. Photo of the flower. Note that the 5 slits or openings on the corolla are formed by the V-shaped walls at the base of each of the 5 curled filamentous segments. Sideview photo of flower showing well the morphology of the interesting curved segments that may be confused as stamens at first glance. Photo of two flowers coming from the same inflorescence. Note the interesting circular or flame-like patch at the middle of each petal. Close up photo of the flower showing in detail the petals, the curly segments and the white central part of flower which consists of a fluffy white stigma covering a ring of 5 stamens. Close up photo of the flower revealing more detail, especially of the central part. Facing the slit-like openings are the 5 white, smooth anthers arranged in the form of a small ring. At the centre of this staminal ring there is the ovary with an extended beige, bristly stigma surrounding and partially covering the anthers. Close up photo of flower (sideview) Through the opening formed by 2 adjecent corolla segments (with a filament-like curved appandage) one can see one of the 5 smooth, white anthers, surrounded by a britsly stigma. Ovary completely covered. Photo of a flower that has less purple-wine colour, restricted only to the filament segments and half way the petal length. Photo of a flower that appears to lack most of the purple-wine pigment and hence has a general lime-green colour. There is variation in the amount of 'purpleness' of flowers between different plants. Colour can vary in any hue from lime green to red-wine, but the latter is more commonly found. Photo of another flower with little purple-wine colour, here found only around the central patch of each petal. Photo of flower inflorescence, which clearly shows to be a dichasium cyme - two opposite flowering branches with the older flower in the middle. Note the small calyx composed of 5 tiny overlapping sepals. Scanned image of some flowers with varying colours as found in Malta. The difference basically consists in the amount of purple pigment present in the flower. Scanned image of a group of flowers, which are arranged as a dichasium (dichasial cyme). One can also note the petals and small calyx of a bud which are nearly of the same colour. Scanned and annotated image of a flower against a white background. Scanned image of flower against a dark background. The filiform segments were removed to have a better focus on the central part of the flower where the reproductive organs are located. Scanned and annotated image of a dissected flower showing the central, green ovary and its extended flap-like hairy stigma above. Another scanned image of the flower. Note the oblong shaped petals with a slanting edge. Photo of several contrasting flowers on the tree. They appear by the end of November in Malta. Photo of the sessile, oppositely arranged leaves that are narrow, have an oval structure and an entire margin. Photo of leaves in situ. They are narrow, as indicated by the species name 'angustifolia' (= narrow leaves). Photo of leaves along a branch. They are sessile and grow as opposite pairs or opposite clusters. Scanned image of a cluster of leaves on the stem. Scanned image of individual leaves. Oblanceolate shape, smooth margin, rather leather-like rough texture and glabrous. Photo of plant in situ. Since of its repeatedly numerous branching, it takes the shape of a large bush. Can cover a diameter of 2.5m or more. Large bushes at a maquis found by the coast of Mistra (Nov 2005). Photo of plant in a rocky habitat. Photo of a small plant. Stems are woody and greyish brown in colour. Photo of several bushes near each other forming an unsurpassable thicket. This shows that this plant can be used to make hedged borders. Photo of a small twig of the plant. Photo of a branch of the plant. Scanned image of a twig of the plant showing forking (2-split) manner of branching. Leaves opposite, flowers often at branch forkings or stem apices. Photo of a paper wasp on a flower. Probably figuring out where the nectar is! Photo of a broken stem to show its milky sap. The family of this plant is commonly referred as Milkweed due to its milky sap. Photo of several buds in situ. Maturity of buds of a given inflorescence differs so that flowers blossom at different days rather than all at once. Black and white illustration taken from Flore et Végétation du Sahara; P. Ozenda, 1991 . Photo of the fruit which consists of a pair of follicles with a tapering rod-like structur that run in opposite directions. Photo of the the fruit follicles often having a reddish-brown colour when maturing. These are about 7-10mm in diameter and from 5cm up to 12cm long each. Scanned image of one seed against dark background. It consists of an flattened oval brown body with a tuft of bristles at on end (=the coma). Scanned image of the seeds which bear an elegant, silky, white coma (about 3-4cm in diameter) without a beak. The seed measures about 5-7mm in length and 2-3mm in width. Enlarged scanned image of the seeds. When completely ripe they will have a brown-grey colour. Photo of more specimens in flower (Nov 2011). Close-up photo of the spectacular flower of this species.